Staccato have spent the last 4 plus years recording their first album which is now available on Drop Card. They have been busy playing at parties, Fremantle Beer Festival and and a heap of other venues around Perth. Please visit our Facebook page. Staccato are some kind of Rock / Pop band comprising of funky bass guitar, melodic guitar, edgy vocals and smooth beats. Ricky has been recording as a session musician since 2003 and has had his music featured on surf videos and jingles. Scott has been playing in bands for most of his life performing in a number of groups such as Hard MarshMellow, Prickle and The Jesus Sandals. Hard MarshMellow featured on 2 compilation CD’s, were nominated for 8 WAMI Awards and also put out an EP. Prickle released an EP before Scott left the band. The Jesus Sandals put out an EP and had a second recorded and ready to go before the band split in 1998. 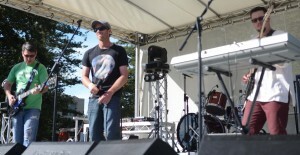 As a solo artist, Scott toured Australia several times, played in Malaysia, played in Europe, put out 3 Albums and was featured on 8 compilation CD’s. Peter has years of band experience. Some of the more well known bands include Mystic Twist, Tormenting Jane and Minus 24. He had a stint with Effigy who toured Australia several times and were signed to Road Runner Records releasing 2 Albums. Go to our spotify page to hear more.